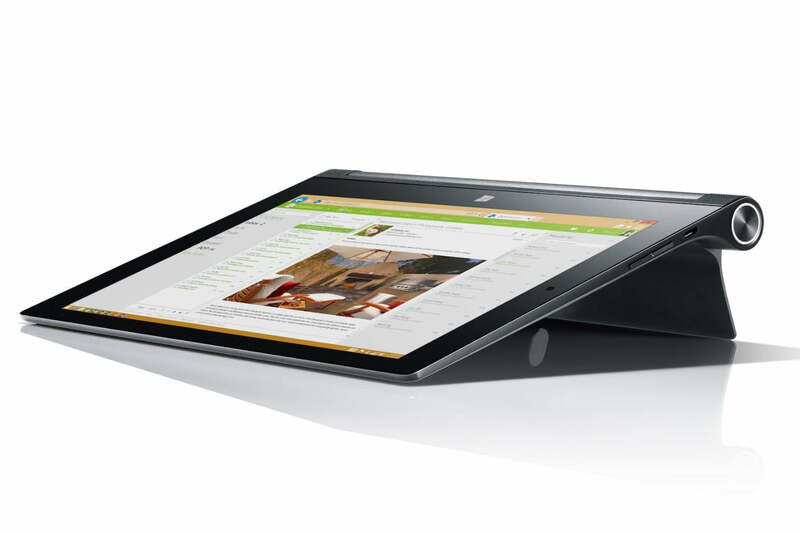 Lenovo has announced a wide range of new tablets and hybrid hardware, all running either Android or Windows 8.1. There are seven products in all, and to make learning about them a little easier, we’ve given each one its own dedicated page. Follow the links below for a detailed overview of Lenovo’s latest device announcements, all of which fall into its Yoga range of versatile hardware. 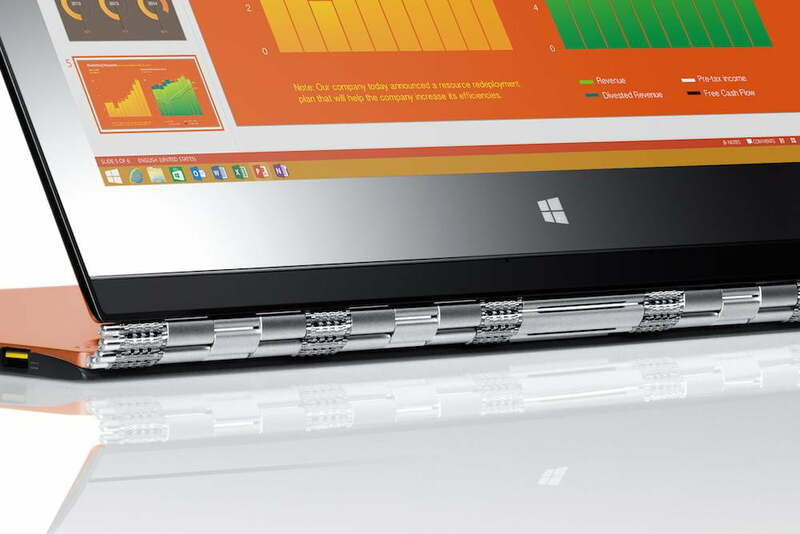 The standout feature of Lenovo’s Yoga Ultrabooks has always been the clever hinge, which allows the screen to be folded over to create a tent-like stand, rotated around to keep the keyboard out of the way, or laid flat for a tablet-like experience. For the Yoga 3 Pro, Lenovo has redesigned the hinge, likening it to a metal watch band, and building it from 800 pieces of steel and aluminum. This, along with other refinements, has made the Yoga 3 Pro 14-percent lighter than the Yoga 2, at 1.19kg. The touchscreen is also impressive, with the 13.3-inch panel boasting a massive 3200 x 1800 pixel resolution, and a Gorilla Glass covering to keep it safe. An Intel graphics card takes care of the visuals, while an Intel Core M70 processor with support for up to 8GB of RAM keeps the Windows 8.1 OS running. Storage is managed by a 256GB SSD, plus there is a 4-in-1 card reader on the 12.8mm chassis. It’s joined by two USB 3.0 sockets, and a Micro HDMI port. 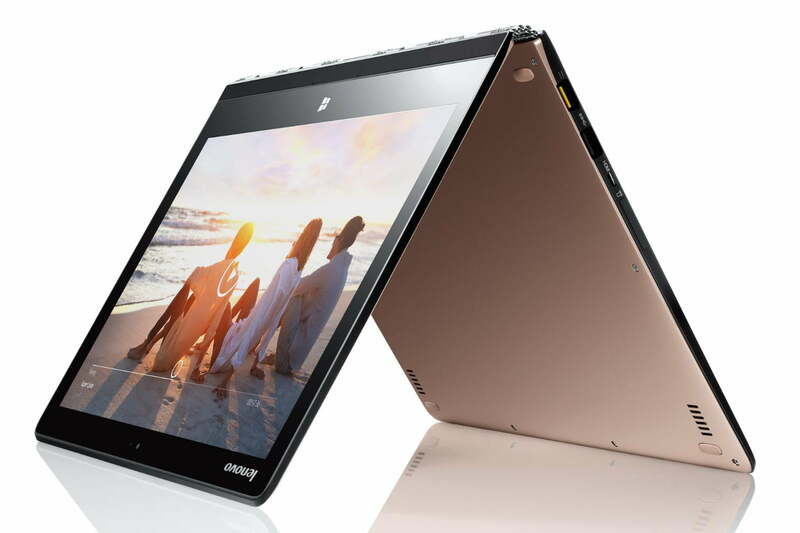 To help manage the Yoga 3 Pro’s multiple modes, Lenovo has installed its Harmony software, where apps can be customized to provide the best experience possible, no matter how the screen is positioned. The software for the built-in JBL speakers does something similar, and adjusts the audio settings for optimum performance, even when the drivers aren’t facing in your direction. 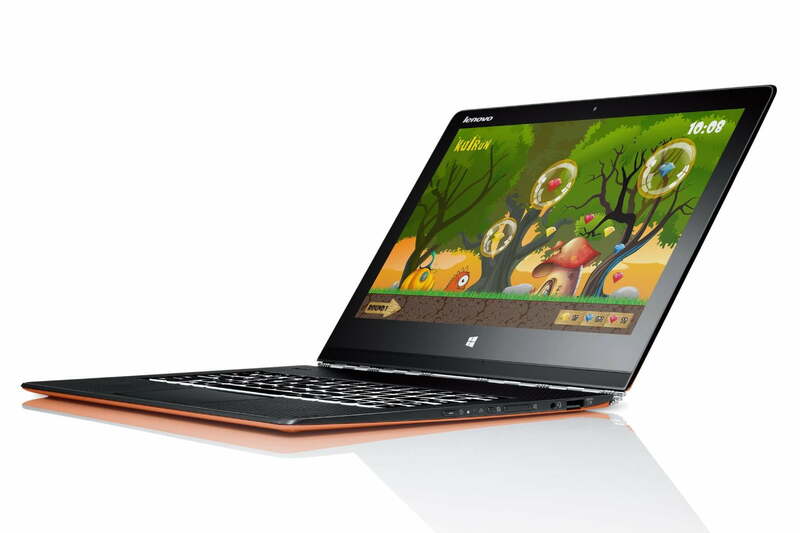 Lenovo will sell the Yoga 3 Pro through its own online store, and through Best Buy, by the end of October. Prices start at $1,350. 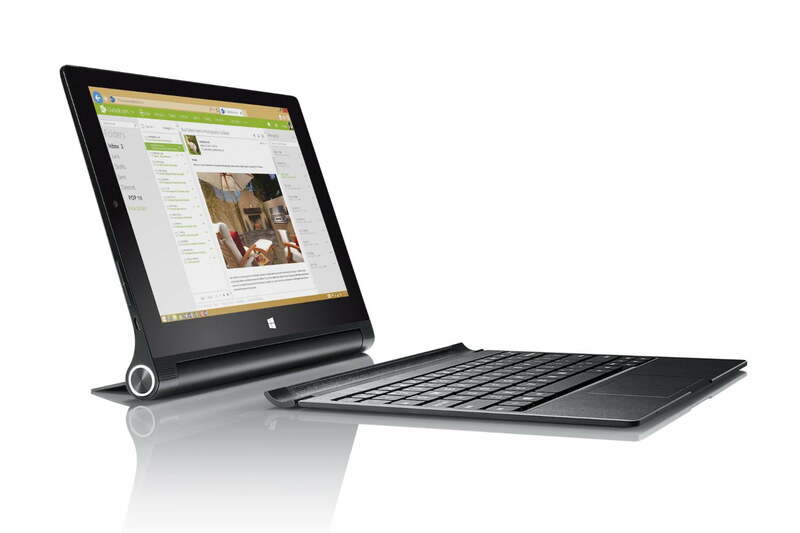 Lenovo’s new Yoga Tablet 2 models are offered with either Windows 8.1 or Android installed, but not both at the same time. There are two versions with Windows onboard, one with an 8-inch display, and the other with a 10.1-inch screen. The specification is almost identical, with an Intel Aton Z3745 processor powering them, along with 2GB of RAM, and 32GB of internal memory. Both have MicroSD card slots, but only the 10-1-inch model has a Micro-HDMI port. An 8-megapixel rear camera, and a 1.6-megapixel front camera are also fitted. Battery life sounds great, with Lenovo promising 15-hours from a single charge, plus the audio should also be impressive, thanks to Dolby and Wolfsen Hi-Fi-tuned dual front speakers. 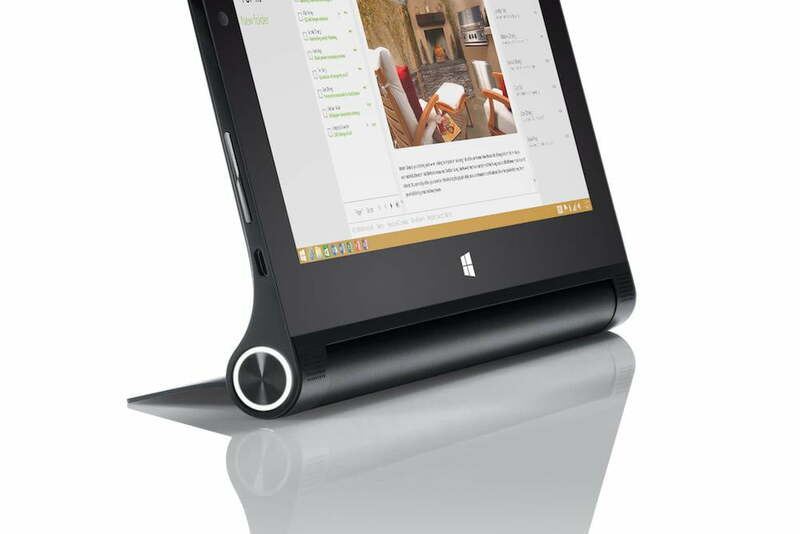 Characterized by its unusual stand, the Yoga Tablet 2 has gained a fourth mode, adding to the original Tilt, Stand, or Hold positions. It’s named Hang, which does what it sounds like, and utilizes the specially adapted built-in stand to hold itself up. The prime difference between the two new tablets, outside of the screen size, is the inclusion of Lenovo’s Bluetooth AccuType keyboard cover, which comes bundled with the 10.1-inch Yoga Tablet 2. Exact costs haven’t been confirmed, but the starting price is $500, which will be for the 8-inch Yoga Tablet 2. Like the Yoga 3 Pro, both these tablets will be on sale by the end of October.